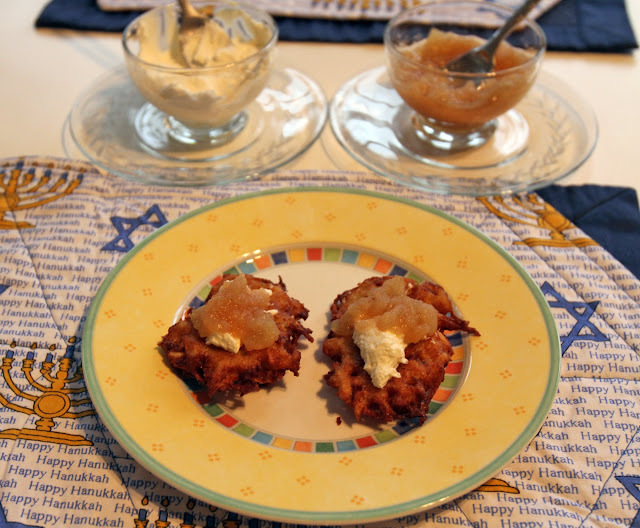 Yesterday’s Mavens, Today’s Foodies: latkes, you’ll eat! I moved to Seattle in 1988, and still recall that whenever I needed a taste of “home”– chicken soup with matzoh balls, a plate of blintzes — I’d frequent the deli-restaurant Matzoh Momma, late of Capitol Hill. The name lives on as Matzoh Momma Catering, with owners Pip and Miriam Meyerson presiding. From mitzvahs to mourning, feeding the needs of the community is all part of their “Jewish-lifecycle business,” as they define it. 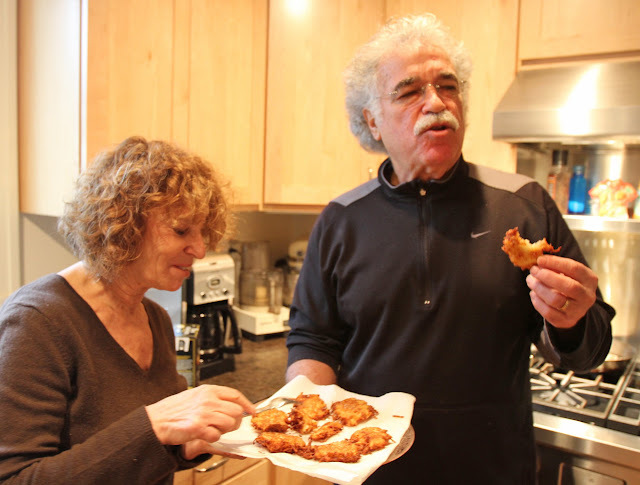 Happily, the Meyersons have been the driving force behind the annual Night of a Thousand Latkes, a Hanukkah fundraiser for MAZON, a Jewish agency providing hunger-relief for people of all faiths and backgrounds. Sadly, they won’t be holding the event this year due to the recent passing of Miriam’s mother. As for those latkes, enjoyed year-round but especially at Hanukkah — the eight-day Festival of Lights that began Dec. 20 at sundown — “You’ve got to eat them while they’re hot!” they implored, welcoming me into their home to watch as Pip fried his potato pancakes and Miriam garnished the goods with sour cream and applesauce (you’ll find that recipe here). They made ’em, I ate ’em. Latkes, with sour cream and homemade Honeycrisp applesauce. “Oil temperature is critical. Do a little drop-test first,” Pip instructs, adding a smidgen of batter, which crisped up quickly. “And salt them after,” he says, generously sprinkling the end result. “Eat!” Having never before officially met the Meyersons, I immediately felt as if they were family. 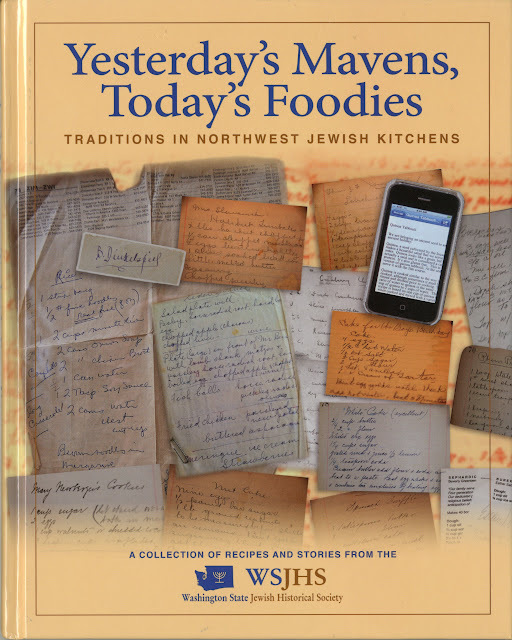 That sense of familial embrace extends to “Yesterday’s Mavens, Today’s Foodies: Traditions in Northwest Jewish Kitchens,” a community cookbook published in November by the Washington State Jewish Historical Society. Among its 250 recipes are Miriam’s mother’s hamantachen (a tri-cornered pastry) and Pip’s justly famous latkes. In it, I found other foods I loved, growing up in a predominantly Jewish East Coast neighborhood. Like contributor Edie Bean’s prakas (stuffed cabbage, sweetened like my mother’s). 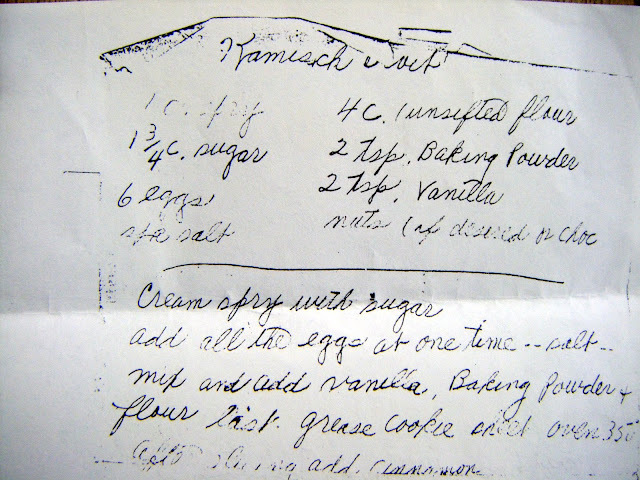 And Marjorie Danz’s kamishbrot, a cookie recipe treasured because it’s written in her mother’s hand (my own kamishbrot recipe is handwritten by my grandmother). This hardcover edition ($36, available here) conjures images that will be familiar to Jews the world over but holds particularly significance for those who call Seattle home. Its very personal stories recall some of the area’s earliest Jewish settlers, whose recipes have been passed down by family born as near as Mercer Island and as far as the island of Rhodes. Seattle’s Jewish community — Ashkenazis, Sephardim, the whole mishpocha — pitched in to bring their stories and recipes to light for generations to come. Arlene Mosler Schuster offers the story behind her hearty whole-wheat bread, made with Cook’s Vanilla Powder– an ingredient her grandfather, Sam Mosler, surely never knew when he opened Seattle’s New York Bakery on Jackson Street in 1899. “As I write out this recipe” for chopped liver pâté, “I think of my grandmother sitting on a kitchen chair with a wooden bowl on her lap and a small chopping blade doing what my Cuisinart does for me today,” writes Molly Cone, whose prowess in the kitchen inspired her granddaughter Dani Cone, the maven behind the Seattle bakeshop, High 5 Pie. Which, funny he should mention it, is where I grew up eating kiggle.